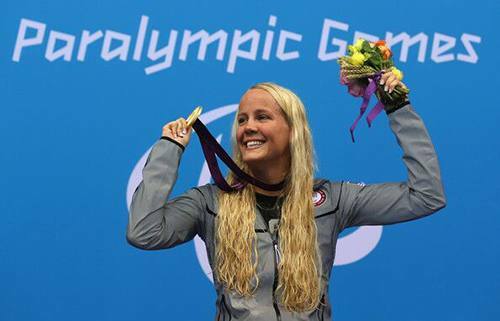 Just a few years ago, Mallory Weggemann couldn’t imagine getting in the pool again, much less competing in the 2016 Paralympic Games in Rio de Janeiro. An “accomplished high school swimmer,” Mallory became paralyzed from the waist down in 2008 after receiving an epidural injection for back pain, according to a feature story on espnW.com. She was just 18 years old and was unsure where these new lanes would lead her. Writer Pat Borzi chronicles the comeback story that Mallory has written for herself, beginning with a fateful Paralympic swim meet at the University of Minnesota two months after her paralysis. That meet was a springboard to get Mallory swimming again — something she feared she’d no longer be able to do. She went on to win gold and bronze medals at the 2012 Paralympic Games in London. She was likely on her way to winning many more medals when “a freak accident in the shower” in March 2014 threatened to take it all away again. The accident, Borzi writes, “left Mallory with permanent nerve damage in her left arm” and serious doubts about the future of her swimming career. Those doubts were put to rest after Mallory returned to Mayo Clinic’s Rochester campus for treatment. We say “returned” because Mallory tells us her Mayo Clinic story actually began in 2013, when she started working with a physical therapist at Mayo. Then, the focus was on “figuring out ways” to walk short distances in long leg braces. That work was put on hold after her arm injury. Mallory began working with another team at Mayo that, in addition to helping her work through a new set of physical limitations, gave her an unending feeling of hope. “The thing that I appreciate most is that nobody at Mayo Clinic has ever told me that I need to stop swimming,” she tells us. Mallory’s comeback story, however, is far from over. She tells us the next phase of her journey will include a reunion with her physical therapist at Mayo Clinic next month, where she’ll begin to work on something even more important than a gold medal. “My goal is to work with my therapist on re-learning how to use my leg braces so I can walk arm-in-arm down the aisle with my dad when my fiancée and I get married in December,” she tells us. We have no doubt she’ll make that happen, too. You can read more of Mallory’s story here. Then go for the gold by sharing your comments below. You can use the social media tools to share this story with others.